Every investor wants to be updated in development of a company to buy market shares and to main company financially and now the source of business and technology is newspaper, news channels, websites about business and etc.., accurate time of information will saves the investors form heavy financial loss, weather if you do not have proper and exact information about stock markets your company will undergoes heavy financial problem. Nowadays news about small stocks and mid stocks is not easily available but about high stock market can easily available. Small investors always prefer the small-mid stocks as they multi-bagger potential, I will prefer google alerts to keep updated about small and mid as well as high stock markets and buying company shares.Google alerts will monitor the website which are you tracking now and for many reasons Google Alerts is very useful to us, such as monitoring in real time, web for specific information about your shares and company, online content, about competition or current trends. Google alerts is a notification service offered by Google through Gmail. When you create an alert message about not only stock market but also all things in web surfing these Google alerts sends you alert message when content in website. In simple words, this google alerts will send you an alert message when an important is published about the item you purchased. Using this you can manage thing such as Monitor mentions of your company, Follow industry trends, track your marketing, Find sources for blog posts and presentations and so on. 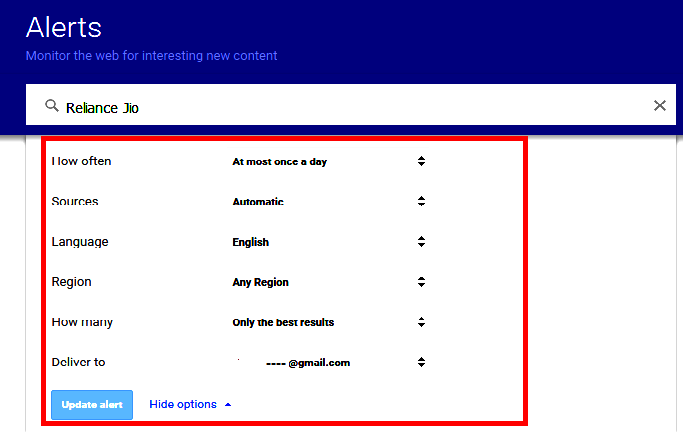 Here you can delete or add some other alert accounts of google and as you know that Google alerts is a free service. The main point in using this Google Alerts is that to updating ourselves in real time about stock markets and etc. purposes as you know that Google directly deliver the relevant news to your email and monitor your alerts at real-time and sends alerted message at real time, so there is no wastage of time, or if you missed an news in a website or an news channel it is too hard track it after few days to see it again so that it is easy to get alert message easily with giving total matter about it. By this alert message you can keep update and saves the company from severe financial loss. First of all sign in to your Gmail account with your login and passwords. Then open the given URL ‘https://www.google.co.in/alerts’. And then a page will be displayed with heading of ‘Alerts’. Then search for the topic which you want to make alert messages and then make click on create alert after search. Here you can manage alert message by clicking on ‘show options’ as shown in below picture. Under ‘show options’ section some options will be displayed such as “how often , Sources, Language, Region, How many, Deliver to”. Select “How often” you want to get alerts, under these three options will be there “As it happens”, “At most once a day” and “At most once a week”. Select email address to which email you want to get alert messages. Then make a click on ‘Create Alert’ button. Repeat this process for all the topics which you want to make alert messages. Open the given URL ‘https://www.google.co.in/alerts’. Then click on ‘Delete’ symbol under ‘My Alerts’ section. On clicking on delete symbol it will delegated. And alerts are stopped to that search. Next to an alert, click Edit Edit. Then click on ‘Edit’ symbol under ‘My Alerts’ section. Then change your settings and then click on update settings button. On Click ‘Update Alert’ alert change will be changed. There are lots of advantages with this Google alerts mainly for investors and companies. Some important advantages are listed below. It (Google Alerts) is a free service. You can create, edit or delete Google Alerts. Anytime when you are free, you are able read all news in your email. Sends notifications on real time. You can read all the notification alerts at any were any time. 1 What is Google Alerts?